This article is about the item. For the special move used by Samus, see Samus Aran § Screw Attack. These items can also be thrown at another player for minor damage, though the jumps often lead to combos. Also, when thrown, anyone it hits automatically performs a Screw Attack. Although this hurts them, if they are close to other players when hit, they hurt them as well. Afterwards, the target that got hit by the thrown Screw Attack enters a helpless state. The item returns in Super Smash Bros. Brawl, Super Smash Bros. for Nintendo 3DS / Wii U, and Super Smash Bros. Ultimate. However, when it is picked up, it attaches itself to the player, much like the Franklin Badge. 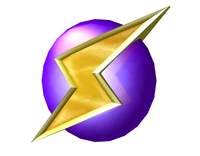 This allows players to use the Screw Attack's powers while using another item, but it does not allow players to throw it at others. 8/89 One of Samus Aran's power-ups from the original Metroid, the Screw Attack turns a jump into a rotating attack move. When carrying this item, any character's ordinary jump move will turn into a Screw Attack. By the same token, if you throw this item at an enemy, your foe will spontaneously do a Screw Attack. NES Metroid A badge you can wear to turn your jumps into Samus's signature Screw Attacks. In Super Smash Bros. Melee, it was an item you carried, but this time around it's a badge you wear--which means you can use it and another item at the same time. There's a good chance you'll be able to string together Screw Attacks and midair strikes for powerful combos. SNES Super Metroid (04/1994) This handy item grants you the same power as Samus's Screw Attack when you pick it up. With the right timing, you can execute a devastating combo of midair attacks. Be careful, though&ndashsome fighters sacrifice the height of their jumps when they're wearing this. This page was last edited on February 28, 2019, at 08:42.